Cub Cadets new 2016 range of ride on mowers are in store now! They feature plenty of power and a great size of cut for an affordable price. This is the entry level ride on in cub cadets range featuring a pressed 46" fabricated deck which is highly generous in size. Perfect for medium sized areas with grass that is not too rough. The main point of difference with the XTLX46 compared to the XTLX42 is the material the deck is made out of. This is the model up fitted with a fabricated deck which is much stronger than the pressed deck. This added durability improves the lifespan of your ride on mower significantly and comes with a 5 year domestic warranty (on the deck)! 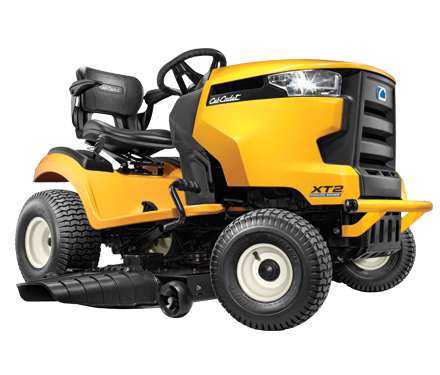 the 22Hp V-Twin OHV Kohler engine will provide your ride on mower with more than enough power to cut your grass. And the reliable Kohler brand gives you the piece of mind that your mower is ran by a trusted brand. Equiped with an electric PTO means that simple fingertip control allows you to disengage and engage the blades with ease.